I'm not a soccer fan. I'm one of those Americans who find the endless running, infrequent scoring and head-banging ball passing not my particular cup of tea. I was relieved when my kids lost interest in the sport and my days as a soccer mom concluded. While I am an occasional armchair sports fan, I prefer watching in person when possible. And if it's on the screen, well, you can rest assured it won't be a soccer game. Yet for some reason, I found myself glued to this morning's World Cup Final. The only rational explanation had to be my coworkers. For weeks, I walked past the screen in the cafe, barely glancing up from the water cooler to see who was playing. Sudden cheers and jeers from the fans in the other room triggered nary a bit of curiosity about what game-changing action had just taken place. Yet, late one afternoon, as I was going through the tedious process of uploading photos for a post, I walked into the cafe and saw several coworkers entranced in the Croatia versus England semifinal. I dawdled just a bit as I waited for my tea to cool down. I looked up to see the game was in overtime. I listened in to hear about England's struggles in the game. Oh, what the heck. What's the difference if I load photos at my desk or in the cafe? My loitering turned into engagement. And I soon shared in the excitement of Croatia's overtime upset. 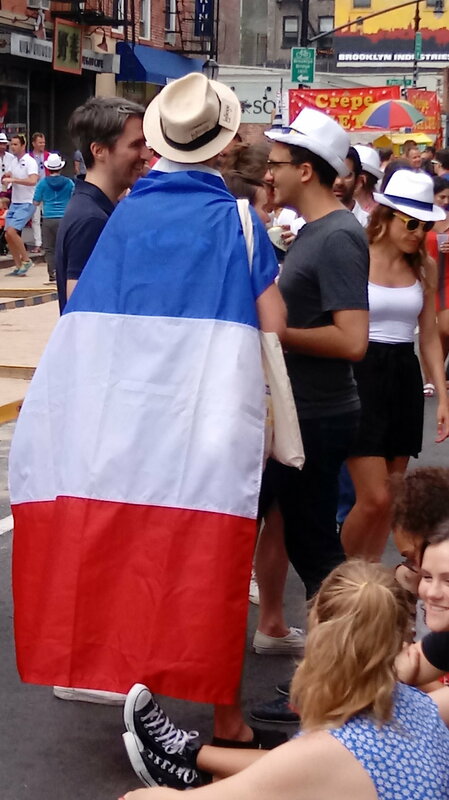 We shared our amazement about the feat accomplished by such a young country. We wondered aloud when Croatia became a country (1991, thanks Sinead for that top-of-mind-fact), how Croatia would be the second-smallest country to be in the final (smallest would be Uruguay I learned this morning). Kelly found a webcam of the live scene in Croatia. Coby wondered if we'd have a repeat of Philadelphia's Superbowl celebration. We exchanged opinions on why England couldn't just get off the pitch and go into the locker room already (apparently it's the norm to grieve in public we decided). So of course I had to tune into Sunday's final to see how it all turned out. Why the sudden interest after less than an hour of viewing a game I considered boring and full of excess drama? 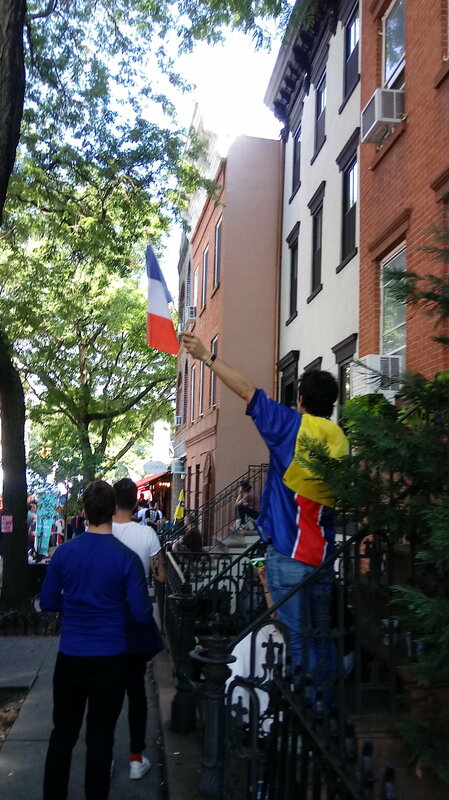 Merely being in the environment with some soccer fans who were more knowledgeable and passionate than me made me more interested in the game, too. And that, I realized, was another beauty of coworking. We talk a lot about the community-building aspects of coworking. We talk about the collaborative opportunities when you share space with someone in a complementary business. But we don't talk as much about how coworking can open our world. How it can expose us to new people, new interests, new ideas, new places. How it can broaden our perspective in so many ways and pique our interest in topics we might never have delved into otherwise. I realized I owe everything in my Netflix queue and my library reading list to recommendations made over the weekly potluck lunch at Brooklyn Creative League. I doubt I would have turned on the game had I not been invested in watching it live with my peers. 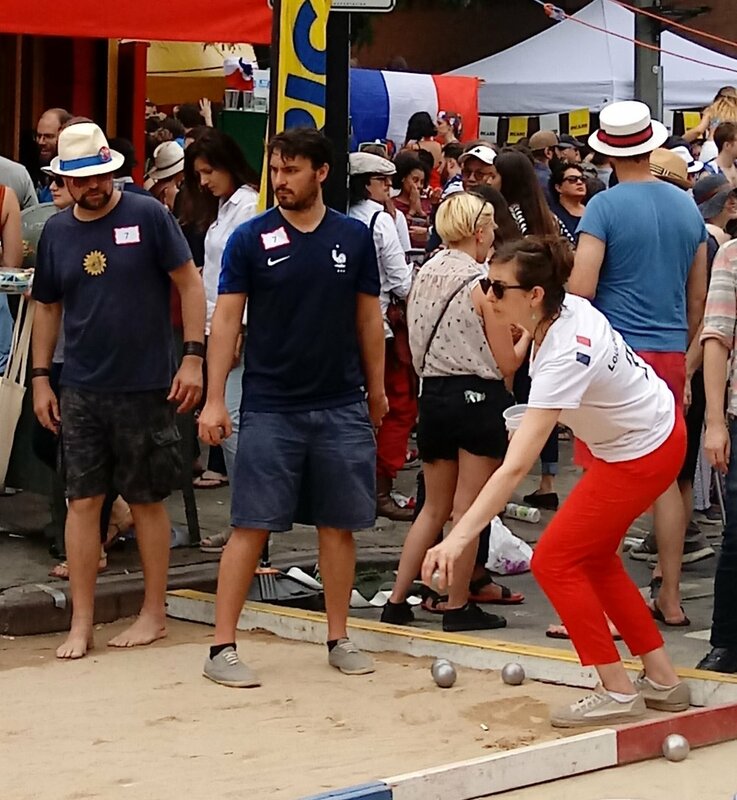 And later in the afternoon, when I walked past the annual Bastille Day celebration in my neighborhood, I knew the excitement was not just about the French holiday and playing Pétanque. It was truly cause for celebration. 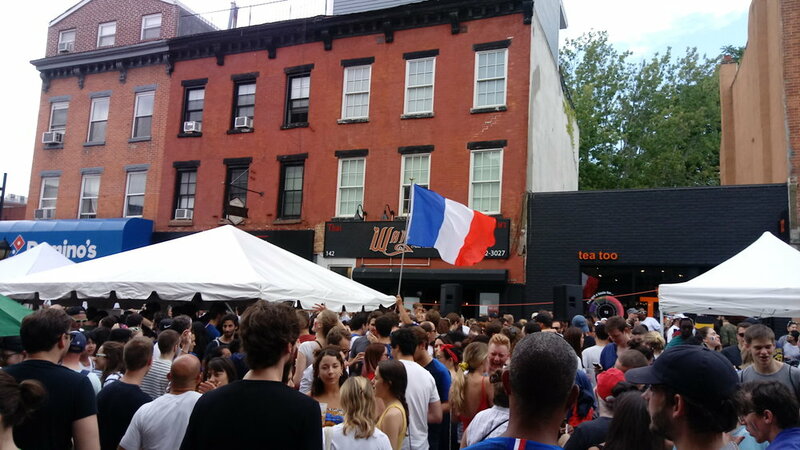 On the heels of their World Cup victory, French pride was in full view at the annual Smith Street Bastille Day in Brooklyn.